Most of us who are passionate learners of any language, have often wished for the opportunity to transplant ourselves to some far distant land,where we could, if even for a few hours, find ourselves mixing and mingling with the locals, providing us the opportunity to sharpen our language skills and have that cultural interaction which we so desperately crave. Certainly, the world of the internet has done much to shrink the world's borders and narrow the expanse of the oceans. When we consider the various media at our fingertips, none will offer us the variety of communication modes or the ability to connect with so many languages and cultures instantaneously, as does amateur radio. What does amateur radio give us the ability to do? Using a transmitter, receiver, an appropriate antenna and no more power than what would light a common light bulb, we have the ability to make radio contacts with other amateur radio operators from all over the world. One moment you are speaking English to a person in Canada. Five minutes later you find yourself speaking French to someone on the island of St. Martin, whose ancestors left France for this remote Caribbean island some 150 years ago. You could then find yourself speaking Spanish to an amateur radio operator in Argentina or Portuguese to a school teacher in Brazil. You could even have the experience of making contact with one of the astronauts aboard the International Space Station, as there is at least one licensed amateur radio operator on the space station at all times, whether from the United States, France, Russia or other participating nation. Radio contacts are generally made by voice using a transceiver and microphone. Some amateur radio operators or “hams” prefer to make contacts using morse code, while wearing a set of headphones. There are now computer to computer radio communications. You'll even find amateur television. The various types of communication will seem endless to you. There are even hams out there who aim their antennas at the moon, just to have their signals bounce back to earth to see who they can connect with, after having their signals travel the distance to the moon and back. There are numerous amateur radio satellites in space, affording the more adventurous types the opportunity to communicate with others, utilizing equipment in orbit around the earth. You will need a government license to be able to talk at the microphone of your own amateur radio station. In most countries there are three different levels of licenses. Morse Code is required in some countries but not all. In order to acquire your license, you will need to take a test. It's not as hard as you might think. In most countries, individuals of any age are allowed to become licensed. If you get on your ham radio every day, you could be speaking English without an accent in no time at all! 1. AnybodyAn amateur radio operatorA shortwave listenerI don't know is licensed to talk to other individuals like himself by using radio equipment and the necessary antenna. 5. Having so many modes of communicationso many radiospeople in the worldI don't know makes it extra fun to interact with foreign cultures. 6. A signal generatortransducertransceiverI don't know consists of a receiver and a transmitter to send and receive communications. 7. Amateur radio operators worldwide have the opportunity to talk with licensed hams on the International Space Stationin distant landsin St. MartinI don't know orbiting the earth. 8. Various modes of communication include voice, computer to computer, morse code and amateur televisionsmoke signalslaser modulationI don't know . 9. Some amateur radio operators make contact with other earth stations by pointing their antennas toward the moonunder waterinto spaceI don't know . 10. 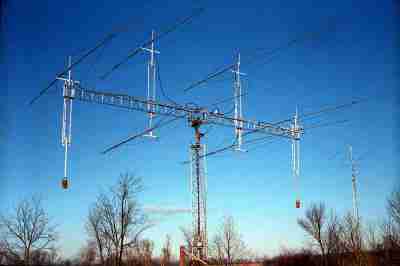 Amateur radio operators can also communicate with each other using tin cans and a stringby using propagation to their disadvantageover amateur radio satellitesI don't know .